Due to kattuvichchi (diviner) saying the divine name ‘kadal vaNNar’, and due to mother repeating that, and saying that phrase to those who came to inquire, and mother saying again ‘emperumAn thiruvarangam engE’ that was said by the daughter before fainting, she got a little bit of consciousness compared to earlier state of previous pAsuram; but as her lover did not show up even then, it became the cause for sadness, and she started calling Him without break; (in this pAsuram) mother is saying this to those who came to inquire, and feels sad. ‘This is the state of her suffering; (since she is calling many of His names due to separation instead of remaining calm, this is the state of damage to the true nature (svarUpam) of her; this is the state of her not listening to my words; reason for all these is my bad-karma’ saying so to them she is sad. Mother is saying so to them only to avoid censure by people; internally for her this immersed state of her daughter is not undesirable (similar to previous pAsuram). thOzhee aNi arangam AdudhumO ennum – Oh friend! Would (we) get to bathe and dance in thiruvarangam?, says she. E pAvamE! – Oh how sad! nenju … thOzhee! – The details of ways in which she is experiencing sadness that was said as ‘irangum’ in the previous pAsuram. uNdaRiyAL – Instead of saying she is not eating, she says she forgot that there is something called eating; when together with emperumAn, it is like ‘uNNA nAL pasiyAvadhu onRillai [periyAzhvAr thirumozhi 5.1.6]’ (There is no hunger when not eating food (but when not involving in services to you, that is actually my being without food)), and ‘uNNum sORu parugu neer thinnum veRRilaiyum ellAm kaNNan [thiruvAimozhi 6.7.1]’ (Rice for sustenance, Water nourishment, betel leaves for pleasure, all objects (which give sustenance, nourishment and enjoyment) are krishNa, the son of vasudhEva as said in SrI bhagavath gIthA 7.19 “vAsudhEva sarvam” (Everything is krishNa)), — being so, so there is no eating; when separated from Him, becomes thin due to fasting, so no eating. uRakkam pENAL – She is not respecting sleep. “You started wearing that cloth only by thinking that it is the one that He liked, as said in ‘pattudukkum ’, isn’t it? Likewise this body of yours is also the one that He liked, isn’t it? If He shows up and sees that this body he loves has lost its luster for enjoyment then He would be sad; to avoid that, matching your softness, try even if it is difficult, and sleep, dear” – I said to her, but she ignored that also. pENAL – implies mother telling her to sleep even by trying hard. As said in ‘anAdhimAyayA suptha: [mAndUkya kArikA – 2-21]’ (due to eternal connection with prakruthi (material world) a jeevAthmA sleeps (does not get true knowledge), and when he wakes up (due to His grace), then he reaches the unparalleled paramAthmA where there is no birth, sleep, or dream), like how one does not know being awake (knowledgeable) before knowing emperumAn, one would not know sleep after knowing Him. nanju, etc – Well she is not getting her benefit (emperumAn), and I am not getting my benefit (Her eating and sleeping), but should she not at least be concerned about her nature of being a girl who should stay calm instead of calling Him and thus destroying her true nature? – asks the mother. Even while her heart is getting destroyed due to separation from her loved One, she should control that within herself, and be such that those who see her would think ‘she is keeping her control’, and make Him lose His heart to her – isn’t that the identity of a girl? Instead of doing so, she started calling Him out with her mouth. (In the previous pAsuram), when she asked ‘emperumAn thiruvarangam engE ’, I thought that she was just talking aimlessly out of sadness; now instead of that she is calling Him (as ‘nambee’) continuously by mouth. Earlier she said as ‘thiruvarangam ’, His town; diviner said about periya perumAL, by saying ‘kadal vaNNar’; now my daughter is saying about His bed (‘nanjaravil thuyil amarndha nambee’ (O nambee who is lying down in the bed of poisonous snake)); from this it can be understood that the first time she was in bed with Him was in periya kOyil. nanjaravil thuyil amarndha nambee ennum – Instead of He losing His state by seeing her, she is being in this state, and is talking highlighting His greatness; nanjaravu – the bed that is not approachable to the enemies; aravu – the bed which is naturally having qualities of a good bed; softness, coolness, fragrant – the qualities that should be present in a bed are present naturally for a snake; as said in ‘prakrushta vigyAna balaika DhAmani [sthOthra rathnam – 39]’ (emperumAn present in the divine body of thiruvananthAzhvAn (Adhi SEshan), with his sentience, strength, having middle part glowing due to the scales..), as required by His lying positions he caves down or springs up, such is the bed we have got; thuyil amarndha – due to the ways of that bed, one would not think about getting up from it even if one were to throw arrows at Him from a bow; such is the comfort of that bed; (because it is poisonous), got to sleep without worrying (about enemies); (since it is soft), able to sleep with enjoyment; amarndha – able to sleep well settled and comfortably in that bed. Translation by raghurAm SrInivAsa dhAsan. This entry was posted in iraNdAm Ayiram, thirunedunthANdakam and tagged azhvar, thirumanga on March 22, 2019 by raghuram. mattuvikki, etc – She having such hair of head that would attract and trouble Him, Oh now it is she who is suffering instead of Him. Only in righteous war (Her beauty getting felt in His heart) would He suffer; she got caught in deceitful war (His beauty reaching her heart), says the mother; (Since it was natural union (gAndharva type wedding) He made His beauty reach her heart without letting her beauty get into His heart). Since it says ‘pathim viSvasya’ (He is the lord for all the worlds), a danger that fell upon a devoted wife can only be rectified by the lord and not by other worldly interests. mada mAnai – She who was submissive to me is now not submissive. Or it means, by mada (madappam) representing quality of a female, she having such natural quality of women. Even if there is excessive sadness due to separation, she would control that unbeknownst to anyone, and not show any change but make Him change – such a girl is now asking openly, ‘Where is emperumAn’s thiruvarangam?’. idhu seydhAr thammai – Since it is not possible to describe with words the trouble she is undergoing, she is showing by her arm pointing to her situation as ‘this’, like showing an ocean. idhu seydhAr – Earlier if I set her hair plait, she would come back without any change to it; now who has made her hairdo to look without any shape or form?, she asks. Or, who is it that made the bees go empty stomach by drying the flowers in her hair? thammai – She is establishing His greatness based on seeing the state of her misery; Oh can there be someone having such greatness of putting her into this misery? thammai – Oh what a greatness this is! What kind of great honey from the hair of noble women (SrI, bhUmi, neeLA) He has drunk and grown so! thammai – Oh one who is the big lover who has made her a great role model in being a lover? thammai – If it is undesirable for her to see her daughter in this position, she would have used normal words like ‘he’ when asking who has done this to her. Since the mother likes this result even though it is hard on her daughter, she uses a more respectful word ‘thammai’. meyyE kattuvichchi sol – Tell the truth (oh diviner!). While the diviner (kattuvichchi) is well known to be truthful, why say – tell the truth? She says to the diviner – you do not think that it is better to avoid mentioning the person directly since it was a natural union (gAndharva type marriage); it is liked by me; so say it as is. When giving treatment one should know about the disease as is, isn’t it? sol ennach chonnAL – (I asked her to say and she said) – The words which have to be asked after serving (an AchAryan) for a long time, I prompted her to say and she said. Like the greatness of emperumAnAr and of gIthOpanishadhAchAryan, is the greatness of this diviner! udaiyavar (out of his kindness) would say the meanings to whoever gave their ears with wish to learn (sevi thAzhththArkkellAm vArththai sollip pOndhAr udaiyavar); gIthOpanishadhAchAryan created interest in him (arjuna) (through the 18 chapters) and told him the meaning (charma SlOkam). sonnAL – Like (the pleasantness of) breeze and dew drops, is there a need for any meaning to what she said? Just her saying words were great that they suffice. sonnAL – Like how it was needed for me to hear, she told like it was needed for her to say. For an AchAryan there is a need for someone (disciple) to hear his words that come out due to overflowing experience after enjoying about emperumAn; disciple shall sustain his life by listening; AchAryan shall sustain his life by saying; the disciple hearing is the reason for his revival; for AchAryan, saying is the reason for his experience. nangAy – (mother addressing a woman who came to inquire) – You are having the completeness of not considering other gods and wordly matters, so I am able to tell you the words that she (diviner) told me. Like how I was needed for her (diviner), you are needed for me, says mother. What is it that she (diviner) said? kadal vaNNar idhu seydhAr – She (daughter) asked ‘emperumAn thiruvarangam engE’ (where is SrIrangam of emperumAn?). She (diviner) is giving reply referring to periya perumAL (kadal vaNNar (one like the ocean)). Here it (the word vANNam) is not about the nature of the sea; it is about the colour. She did not get involved in His nature (svarUpam), not His qualities; just upon seeing His beauty in front of her eyes, she fell for it. It seems He saw her once and embraced her; she got caught in that beauty; if one is involved in His nature, they would have to be involved in His qualities also which are inseparable from His nature; for those involved in His divine form that highlights both His true nature and His qualities, there is no need to go somewhere else. It is His divine form that creates interest; it is His divine form that is suitable for seeking shelter; what is enjoyable is also His divine form. idhu seydhAr – ‘theerA nOi seydhAn [siriya thirumadal – 52]’ (He created incurable disease (of love)). idhu – (this) – Like how one can identify easily that it was due to drowning in water when seeing a fainted person, her love disease is clear from looking at her. This is ‘dheiva nannOy [thiruviruththam – 53]’ (disease (of love) due to emperumAn). Since this disease occurred due to love towards emperumAn, this is a distinguished great disease. What the learned people yearn as the ultimate benefit (purushArtham), she got this disease of love by the grace of emperumAn without any effort from her side. 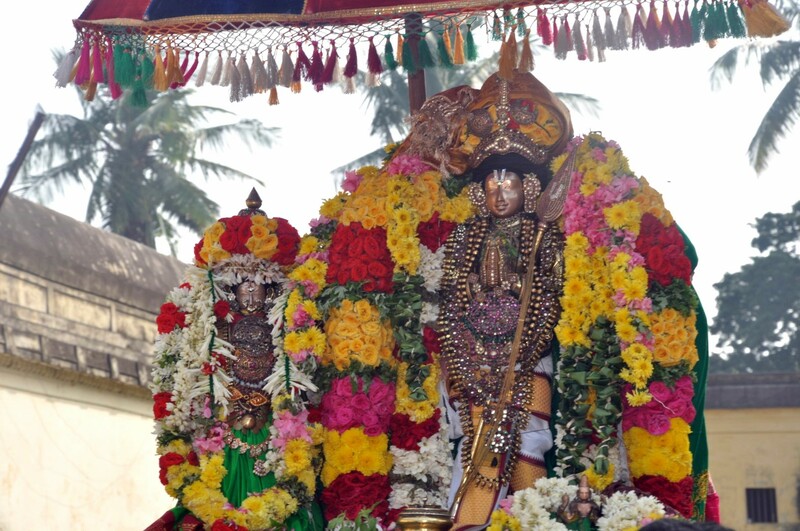 As said in ‘janmAnthara sahasrEshu [laghu – vishNu smruthi]’, etc., (For those who have gotten rid of their sins by doing gyAna and bhakthi yOga in thousand earlier births, love towards krishNan is born), the devotion reached by those after trying other means for thousands of years, she has got that love by the grace of emperumAn without expecting any effort from her. (Doesn’t a prapannan also need bhakthi?) Whereas bhakthi is the ultimate reach for those who use other means like karma and gyAna yOgams, for a prapannan bhakthi is the first step of the attainments. kadal vaNNan idhu seydhAr – He showed His form and stole her form. (If it is one for the other, why be sad?) He showed His form that is like ‘Urdhvam mAsAnna jeevishyE [Sri rAmAyaNam – sundhara kANdam – 38-65]’ (I would not live after one month (if He does not come and save me before that)), and stole her form which is like ‘na jeevEyam kshaNamapi [Sri rAmAyaNam – sundhara kANdam – 66-10]’ (I will not live even for a moment when separated from her (said rAmA)). (Her form is greater than His). kAppAr ArE – Is it even possible to remove this love disease given by Him using your medicinal roots and magic words? (asks mother). (It is He who is the medicine and manthram (words)). The disease due to involving in worldly matters could be rectified by showing emperumAn related matters; the love disease due to emperumAn is congruent to the true nature of AthmA, so it would be incurable till there is AthmA (for ever). kadal vaNNar idhu seydhAr kAppAr ArE – (Considering this whole phrase as that of the diviner instead) (kadal – ocean) Do we have another option than to leave it for the ocean, what the ocean has taken in? kAppAr ArE – (another meaning for kAppu – prevent; ArE – who can) Is it possible for her (parakAla nAyaki) to prevent from taken in? Is it possible for you (mother)? Is it possible for anybody else? (No). If the fence itself destroys the paddy field, it is the fence that would have to save the field; is it possible for the field to save itself? (In siriya thirumadal too periyavAchchAn piLLai shows this meaning for ‘kArAr kadal vaNNan pin pOna nenjamum vArAdhE ennai marandhadhu thAn’ (my mind that went behind the One having the colour of ocean has forgotten me and not returned (from the sea)). By this, the inner meaning shown are the following – (1) emperumAn got AzhvAr without expecting anything on AzhvAr’s side; (2) Due to that, great devotion (parama bhakthi) was born in AzhvAr; (3) because of that, AzhvAr lost interest in other matters; (4) One would get true knowledge based on AchAryan’s teachings (‘through diviner’). This entry was posted in iraNdAm Ayiram, thirunedunthANdakam on February 16, 2019 by raghuram. pattudukkum – She started to wear a saree. (How could she do that while being unconscious?) Similar to many actions that are going to be described, this is also one of many contradicting actions of someone who has fainted due to separation. When He is with her, more than the beauty of individual parts of her body, and more than the overall beauty of her, He enjoys the beauty of her dressing saying ‘Oh! Is it possible to have such beauty in clothing!’. Seeing that He is well attracted so, she thinks that if we dress with silk saree then He will come and see her, and so uses wearing of it as sAdhana anushtAnam (a means to get Him). She started to wear the saree; she thought that if she wore it He will come thinking ‘We should not miss this’, and so started wearing the saree. udukkum – (this word is in present tense because) she keeps wearing and removing the saree till He comes. (Is it appropriate for one to decorate one’s own body, whereas He should have dressed her with that?) It is befitting the true nature of oneself to decorate for the lover. When the lord is longing for it, wearing it by one’s own effort is preferred. ayarththu – She was happy thinking that if she wore it then He will come. She fainted (due to disappointment of separation) when He did not come even after that. She decorated herself for Him to come; since she did not see Him coming even after that, her effort fell into the trap of svArtham (doing for own pleasure); since it is a damage to svarUpam (true nature of subservience), she fainted. Fainting due to separation is not same as (is at lower level) than fainting due to damage to svarUpam. Irangum – As said in ‘pralApasththA sammOha:’ (after getting tears, would get fainted), whereas it is seen in general that the fainting comes after sadness, it is said in reverse order here – such is the greatness of the matter from whom the separation is, and the greatness of the depth of her sadness due to separation is. Sadness is – tears that come based on sadness due to the urge to get and hug Him. Since there would be less sadness when fainted, this state of longing brings more sadness. pattudukkum – Implies that she has crossed the stage of a very small girl who was not shy to move around without clothes, and now that she has grown to the next stage of being shy to do so, she wears the clothes. pattu – The word ‘pattu’ implies just an ordinary cloth too. Or, as aforementioned it could imply silk cloth too as said in ‘poththip puliyugirp pattu’. udukkum – (This is in present tense because as she is a small girl,) the cloth keeps slipping down, so she keeps pulling it up and wearing it. (As she is of age where cloth does not stay put in her hip, can she be expert in love towards emperumAn? Is there another example of that?) The other mother (of parAnkusa nAyaki (nammAzhvAr)) also said the same thing about that girl as ‘mulaiyO muzhu muRRum pOndhila, moipUnkuzhalkuRiya kalaiyO araiyillai – ivaL paramE [ thiruviruththam – 60]’ (.. cloth does not stay in her waist .. (to show that she is a small girl)). ayarththu – Even at this (adolescent) age, she is a fine example of love towards emperumAn that she would faint due to separation. irangum – During this state of longing (compared to the stage of fainting when there is no sadness felt so it is comfortable) she got the conscious knowledge and so there is sadness due to thinking about Him. Since there is no conscious knowledge in the state of unconsciousness, there would not be sadness. pAvai pENAL – Seeing her current state, and thinking ‘What could be a way to keep her alive?’, as she had seen earlier (before she got involved in bhagavath vishayam) that she used to play with the wooden woman doll all the time without food or sleep, she brought that doll and showed it. It was like a poison to her eyes (so she ignored it). She who would not be without those dolls is now (due to love towards Him) is rejecting the dolls. Her love is such that she has rejected the connections to her play things that matched her age. By this, AzhvAr shows the meaning that for those who are immersed in the matter of emperumAn, other matters would be poisonous to the eyes even upon just seeing them. Like how love towards Him happens due to His grace, disinterest in other matters also happens by His grace. pani nedum kaN, etc. – Sleep also has left her completely. pani nedum kaN – As said in ‘AhlAdhaSeethanEthrambu: [SrI vishNu thathvam]’ (Having cool drops of tears due to joy), during the time of union the happy tears would be cold. Or, nedum kaN – Her eyes can control into a corner the emperumAn who owns both the worlds. Beauty of eyes relate to the greatness of gyAnam (true knowledge). neer thathumba – because (eyes are) brimming with tears of separation. paLLi koLLAL – She does not sleep. During the time of union she would not sleep due to joyful tears; during the time of separation she would not sleep due to sorrowful tears. During union He won’t let sleep. During separation, its sadness won’t let her sleep. Instead of using the colloquial word for ‘sleep’ to describe the state of one born from her stomach, why is the mother using more respectful word for it? (why say ‘paLLi koLLAL’ instead of ‘uRangAL’?) – Even if one is born from her stomach if she becomes wife of a king, the mother would call her using more respectful words like ‘AzhvAr, nAchchiyAr’. 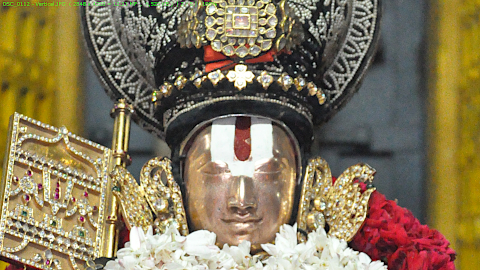 This way of addressing by thirumangai AzhvAr is the reason for the decree and following by pUrvAchAryas (preceptors) as the meaning of SAsthram that one shall address someone who is having relationship with emperumAn, be it even a son or a disciple, with more respectful words that reflect their greatness. Considering her tenderness, she is worrying ‘Oh she is not sleeping!’. ettuNaipodhu en kudangAl irukkakillAL – Seeing her not sleeping, based on the habit of seeing her sleep in her lap, she gave her lap. Since it is like hugging a fire, she got up from the lap startled. ettuNaippOdhu – For one who would not be without staying in her lap, it is now not fit. en kudankAl – Oh who is it that has given her bad advice that she cannot stay put in my lap? – she says. How she has lost the relation with both the doll she protects and the mother who protects her. How she has lost the relation with both her beloved doll and worshipped mother. irukka killAL – There is no need for her to sleep, let her just be awake while being in my lap – with this interest she tried to take her hugging and keep her in her lap; even that did not work. killAL – she is not having strength to do that. (not able to do that). She is not able to sit even if she tries after seeing the despondence in my face. She is not thinking this as a complaint against her daughter but saying ‘she is not able to’. Even if she is liking to sit in the lap, she is in the state that it may be possible to sit in fire but not in lap. By this – Loss of interest in worldly ones like doll and mother is not due to knowledge of considering them as lowly. It was being there naturally for her. Like how love towards emperumAn is present naturally, disinterest in other matters is also present naturally. (Mother continues to say – ) Is that all that she does? She also does this – emperumAn thiruvarangam engE ennum – She is asking where is the temple of the one who made me be for Him only. She is asking – where is the temple of the one who cut the connection with other things whether it is doll or the lap of mother? Instead of asking where is the temple of such and such by using His name, why is she using the word ‘emperumAn’? Since it was natural way of union (gAndharva type wedding), they united based on femaleness and maleness only; only if there were others to remind them about each other would she know the name; how did she come to know that His place is kOyil (thiruvarangam)? During union, realizing that there would come a time of separation, He was saying ‘I won’t leave you; I won’t survive if I leave you’, for her to tolerate the separation He said ‘my place is kOyil (thiruvarangam)’, and thus mentioned His place. By that, she is saying ‘place is kOyil’. emperumAn – One who gave Himself to me in writing, thereby got me to Him in writing. thiruvarangam engE ennum – She would know that the kOyil (SrIrangam) is in the west side (from thiruvAli thirunagari) . Why is she asking where is it? If she is not able to see and not able to see any direction due to sadness of separation, then it is given that she would have to search for direction. This entry was posted in Other on February 15, 2019 by raghuram. In the previous pAsuram he said with sadness ‘mudhal AnAyE’. With that fear, he reached the state of a female; that too she (as parakAla nAyaki) is unconscious and so not in a position to call on here own (mood); she is talking through someone else, as the prabandham proceeds further from here. That is – as she (as pirAtti) united using the natural method (gAndharva type of wedding) [a type of wedding in which the man and his lady love get married without the consent of elders] and then got separated; due to that sadness – it kept happening that she would go into alternating states of consciousness and unconsciousness, and that too in incorrect ways (instead of feeling sad and fainting, she would faint and feel sad (ayarththu irangum)); her groups of relatives were not able to figure out that such and such could be done for this, or not done for this; not knowing the reason behind this disease, those with expertise in medicine and magic entered the scene and started their attempts to cure this disease; at that point, a diviner (kattuvichchi) who is devoted to emperumAn said ‘You are not understanding the reason for her disease; she got this disease due to emperumAn; it can be removed only by Him’. AzhvAr divines about his state through this pAsuram as the words of the mother saying about the actions of her daughter and about the words of the diviner that she heard, to those who came to inquire. If asking – even then, is it possible for the perception of being a female to be born for AzhvAr (who is a male)? As said ‘svAmithva Athmathva SEshithva pumsvAdhyA: svAminO guNA:| svEbHyO dhAsathva dhEhathva SEshathva sthreethva dhAyina:’ (Lordship, being AthmA, getting benefits, being a male are emperumAn’s characteristics; these give to jIvAthmas, respectively, the characteristics of subservience, being the body (with emperumAn as AthmA), and being of help/giving to others, and being a female), since the maleness of emperumAn is of the nature of giving femaleness to others, it is acceptable to get the mindset that ‘I am a female’. Getting to the mindset of femaleness is not based on him having characteristics of a female body; it is based on love that female would get toward male. If asking – where have we seen those of same gender getting the mindset of opposite gender? As said in ‘pAnchAlyA: padhmapathrAkShyA: snAyanthyA: jagHanam gHanam| yA: sthriyO dRushtavathyasthA: pumbhAvam manasA yayu:’ (When dhraupadhi, one with eyes like petals of lotus, was taking bath, the other women on seeing the big and beautiful backside of hers thought in their minds that they should become men), due to the greatness of her beauty, the passion that arises for men when seeing such women arose for these of same gender. Likewise, it is acceptable for passion to arise for AzhvAr also in the matter of purushOththaman (emperumAn) that which arises for women. It is the special quality in someone that brings the mindset of opposite gender in others. So he is getting into the state of a pirAtti (female consort). Furthermore, what is the thought behind saying that AzhvAr fornicated with emperumAn based on natural ways (gAndharva type of marriage)? What it implies is – only based on the relationship that sarvESvaran is having towards the sentient, He takes them under His wings without any attempts from their side (nirhEthuka vishayeekAram). If asking How? – (thamizh texts explain fornication based on wedding in natural way (gAndharva wedding) in this way) – when a girl goes outside to a grove and is plucking flowers, her lover, in the name of going hunting, comes there, and her friends are also separated from her due to other activities, and now, only due to the reason of Him being a male and Her being a female, even though there is no one to remind them or join them, they fornicate; this is the natural way of fornication. Femininity is – the state being there fully for a male. Masculinity of the other party is – being the lord that befits the true nature of others (as servitors), and being the protector in all ways; so, this natural way is talking about His taking us without expecting any action from us. But, when emperumAn is taking us up, (if saying nirhEthukam), why is there a need for some AchAryas who remind Him, and why is there is a need for ones like pirAtti who help in joining/recommending us? AchAryan reminding at that time is to highlight the relationship of ‘owner – property’ between emperumAn and jIvAthmAs. In jIvAthmAs, AchAryan removes the thought of considering body as AthmA, and the thought ‘I am independent’ which arises due to the connection of AthmA with body. pirAtti unites them to Him by making Him forgive their mistakes by reminding Him about His relationship with them and about the qualities like vAthsalayam in Him that arise based on such relationship. Furthermore, what is the thought behind the words of this pAsuram that says there are people with medicine and magic that are trying to cure her disease without realizing her state, and there is a diviner (kattuvichchi) who tries to stop their activities? Disease that comes due to interest in worldly matters may be curable by other means (like medicine, magic); in case of disease due to interest in Him, it is He, who is the reason behind the disease, who has to come and cure it. (Since) the togetherness with Him will be there till the time there is AthmA (forever), and since this love is as per the true nature of them, it cannot be cured (if separated, or, by other means). AzhvAr is speaking as Himself first (in first 10 pAsurams), and then is speaking as a mother in the next 10 pAsurams). How does this fit? When a river is flowing, when its water level increases, in addition to staying within its shores it would fill branching canals as well, all the while being full by itself and merge into the sea. 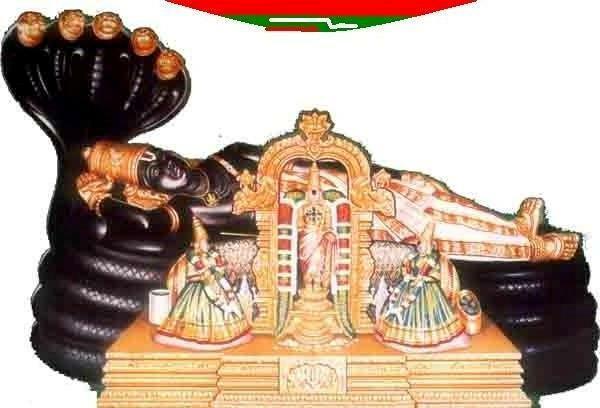 Likewise, due to his overflowing love, when the words of mother also happens without any deficit, it would be fitting that his own words also happen in parallel without any deficit.Furthermore, when parakAla nAyaki (female name of thirumangai AzhvAr when he is in that state), is in fainted state, as said in ‘bHruSam bHavathi dhu:kHitha: [SrI rAmAyaNam – ayOdhyA kAndam – 2-40]’ (if seeing His people’s suffering, SrI rAman becomes sad (more than them)), when her mother is supposed to be even more sad, does it fit that she is saying the words with clarity in these pAsurams? When chakravarththy thirumagan was having sadness upon separation of (seethAp) pirAtti, iLaiyaperumAL’s sadness would have been double due to sadness of perumAL and due to the tiredness of performing services in the forest, iLaiya perumAL tolerated that based on understanding that it is time to do so, and spoke clearly to perumAL and consoled Him; likewise, it is appropriate for the mother here to speak clearly considering the survival of her daughter; while the one to be protected is sad, the protector though having equal sadness would need to do the hard task of tolerating it and speaking clearly. How is the mother’s speech the reason for the daughter’s survival? Since kattuvichchi’s words are about emperumAn (which the mother tells others), and since her activities are based on detachment, and since the mother also talks about Him as ‘Oh this girl is suffering the suffering that He is supposed to undergo by seeing this girl’s beauty’, it is proper that these words will help the girl survive. Also, since this kattuvichchi is unlike the kattuvichchi in ‘theerppArai yAm ini [thiruvAimozhi – 4.6]’, but is like the kattuvichchi of siriya thirumadal who is devoted only to emperumAn, parakAla nAyaki thinks ‘even if my disease is not cured, it would be enough to get the touch of such kattuvichchi’, and so since the talk is about such kattuvichi, it would help in parakAla nAyaki’s survival. Furthermore, the first ten pAsurams are his own words as AzhvAr; second ten pAsurams are mother’s words; third ten pAsurams are the words of pirAtti (AzhvAr as parakAla nAyaki). As said in ‘machchiththA: madhgathaprANA: bOdHayantha: parasparam [SrI bhagavath gIthA – 10.9]’ ((1) (they are having life) with their mind directed towards me, (2) having the life that is about me, and (3) and discuss among each other (about whatever characteristics they each enjoyed in me), these three phrases are the meanings for three Tens respectively (this is established by preceptors (pUrvAchAryas)). machchiththA: is madhEkachiththA: (they have directed their mind Only toward me); without mixing of interest in other things, being there only for Him (ananyArha:), not having anything else as enjoyable (ananyabhOgya🙂 AzhvAr speaks as himself about emperumAn only, so the first ten is based on gyAnam (clear knowledge about facts). Second ten – due to the gyAnam came vairAgyam (no interest in other matters, staunchness in Him), through which it talks about the greatness of love of parakAla nAyaki towards emperumAn; Third ten – since the love is ebbing this way, it talks about spending time with other devotees while living here until the time of reaching Him. madhgathaprANA: (them having their survival based on me)– is the meaning shown by second ten pAsurams, since it is not being her words but she has fainted, and it is based on the words from the mouth of the mother. bOdhayantha: parasparam – Third ten pAsurams are set as the discussion between parakala nAyaki and her female friend (thOzhi) about their experience towards emperumAn. In this second ten pAsurams, first pAsuram, the mother is explaining to those who came inquiring, about the daughter’s lack of interest in other matters, and about the words of kattuvichchi (diviner). This pAsuram is having one phrase here telling the inquirers, and another phrase there expressing her wonder. ‘Oh what a deep lover she is towards emperumAn that she becomes so sad when separated from Him!’ is the internally running happiness in the mother. If (the mother is) so happy in her heart, why does she not convey that to those who came inquiring? Since it is the natural union (gAndharva type wedding), she is unable to talk about that to them. She can say it only if the wedding happened through the recommendation of others; we can celebrate one’s relationship with emperumAn only if it happened through AchAryan’s advice. (Isn’t the perturbation/fainting (parakAla nAyaki’s state) to be avoided?) – The perturbation, when he was one among the samsAris (people interested in worldly matters), was due to ignorance; after getting the true knowledge (through emperumAn’s thiruvashtAksharam), that got cleared; the perturbation that is present now is due to true knowledge, and it cannot be cleared till the time there is AthmA – is the meaning highlighted in this pAsuram. kattuvhichchi ! – “Oh the (female) diviner! idhu seydhAr thammai – who brought her to this state? kadal vaNNar idhu seydhAr (enRu) sonnAL – ‘The one having the color like that of the sea, perumAL, has created this state” – she said. kAppAr ArE – who else is there who could remove this danger? 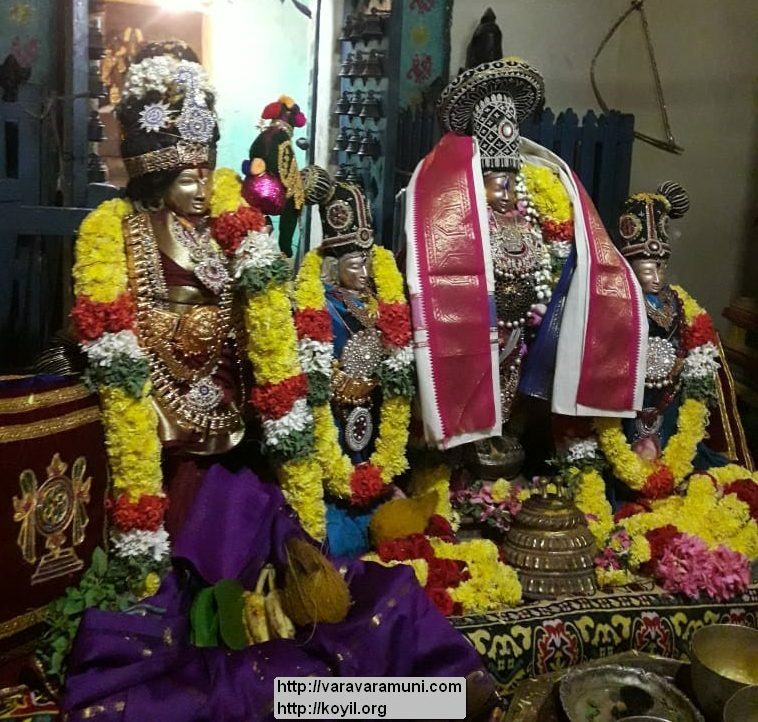 This entry was posted in iraNdAm Ayiram, thirunedunthANdakam on February 13, 2019 by raghuram. ulagam, etc. (up to guNapAla madhayAnAy) – it is about how AzhvAr has built the ‘elephants’ in the four directions. ulagam Eththum then AnAy – Oh You who have come and stood in the divine mountain of the south (thirumAlirunchOlai) for both the worlds (leelA and nithya vibhUthi) to come and take shelter! You came and are providing divine presence not just for those who are based around this mountain to be living/surviving, but even for nithyasUris to come and have the great feast that are your auspicious qualities such as simplicity, as said in ‘valam seyyum vAnOr mAlirunchOlai [thiruvAimozhi 2.10.8]’ (nithyasUris, the residents of paramapadham, do favourable acts towards thirumalai). Oh You who is like an elephant, in the direction of South! – is the meaning. vadavAnAy – In the same way is how You have divined your presence in the north direction. ‘ellA ulagum thozhum Adhi mUrththi [thiruvAimozhi 3.3.5]’ (being approachable by everyone (without any discrimination in greatness, etc. ), being the cause of everything, sarvESvaran (supreme lord)), that is, thiruvEnkatamudaiyAn is standing there without discriminating between nithyasUris, brahmA etc., and humans too, for them all to live/survive. kudapAl AnAy – Unlike the aforementioned elephants, there in the direction of west, periya perumAL has come and is lying down with closed eyes, like an elephant with madness (madham), reclining. As said in ‘vanperuvAnagam uyya, amarar uyya, maN uyya, maNNulagil manisar uyya [perumAL thirumozhi 1.10]’, He has come to the kOyil (SrI rangam) and reclining with closed eyes, for all the worlds to experience Him and live/survive. kuNapAla madha yAnAy – Oh who is like a mad elephant, being present in the east direction! (thirukkaNNapuram). Due to his love towards nAthamunigaL (and ALavandhAr), emperumAnAr would call the emperumAn mannanAr (of kAttumannArkudi) as kuNapAla madha yAnAy, considering mannanAr’s beautiful form, great pride, beauty of His aspects. (kAttumannAr kOyil is not included as part of 108 dhivya dhEsams). 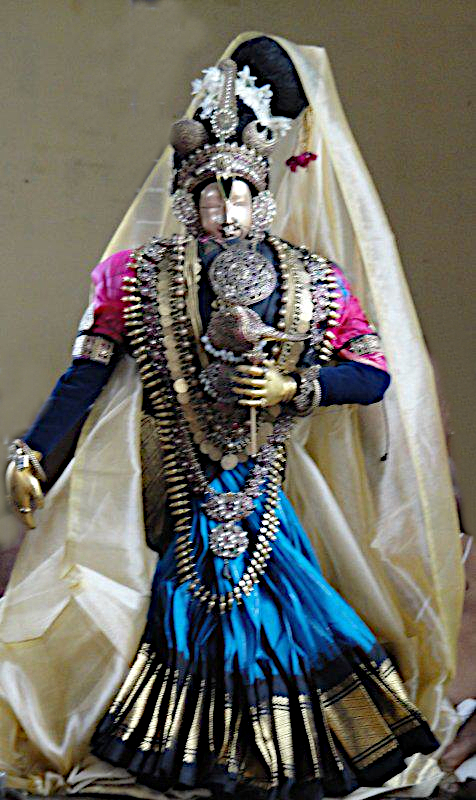 ‘thrutheeyam krishNa nagaram’ (Third among the five abodes of krishNa, viz., kaNNankudi, kaNNamangai, kaNNapuram, kOvalUr, kaNNan kaviththalam), it is read in the puraNas as the third abode among the 5 places of krishNa, and as said in ‘karuvarai pOl ninRAnaik kaNNapuraththu ammAnaik kaNdAL kolO [periya thirumozhi – 8.1.2]’, and ’kaNNapuram onRu udaiyAnukku adiyEn, oruvarkku uriyEnO [periya thirumozhi – 8.9.3]’, and ‘kaRRAr sEr kaNNapuram [periya thirumozhi – 8.10.5]’, thirumangai AzhvAr being ever fond of that dhivya dhEsam, it can be considered that he is divining about thirukkaNNapuram. The phrase ‘ulagam Eththum’ (divine abodes praised by the world), (that appears before the first of the aforementioned four directions), is applicable to all the four. imaiyOr, etc. – By this phrase AzhvAr is talking about Him (paramapadha nAthan) who is present as the means and the destiny. imaiyOrkku enRum mun AnAy – Oh who is present for the nithyasUris to see You always directly. Oh who is being the object of vision forever (as said in ‘sadhA paSyanthi [rig ashtakam 1.2.7]’). pin AnAr, etc. – even for the people of malai nAdu (kerala) to know the place which is filled with those who do not know any about paramapadham, divine milky ocean, incarnations, or the archA forms (statue) of emperumAn, You are present in thirumUzhikkaLam! You are ever present in the western ocean for becoming the target of surrender even for those in malai nAdu that is filled with nasthikas. By ‘pin AnAr’ (lowly) it could imply those whose state does not have any more comparable lowliness, who are even lower than brAhmaNa, kshatrhiya, vaiSya, and also even lower than the fourth varNam – even for them to attain Him, He is present in thirumUzhikkaLam. pin AnAr vaNangum – He being attainable at the same level for those who are considered lowly based on place, time, or birth. mudhal AnAyE – Oh You being the first root of goodness for all – for them to know that emperumAn Himself is the means and destiny, and for them to experience Him at divine abodes (dhivyadhESams), and for all the other greatness of Him! This is said too in ‘thvath pAdha kamalAdhanyath na mE janmAntharEshvapi | nimiththam kuSalasyAsthi yEna gachchAmi sadhgathim || [jithanthE sthOthram – 1.10]’ (There is nothing in any birth other than Your divine lotus feet that is the first goodness (root) which is the cause of means which would get me to attain You). Or, it is talking about Him being the root cause of creation of worlds. Or, mudhal AnAyE – it is talking about ‘Oh You who created me in such a beautiful way that I suffer (as described in earlier pAsurams, that is, being separated from Him, not able to see Him, etc), and so AzhvAr completes the first ten pAsurams with such sadness. This entry was posted in iraNdAm Ayiram, thirunedunthANdakam and tagged aanai, thandakam, thirumaliruncholai, thirumalirunjolai, thirumuzhikkalam, thiruvengadam, thiruvenkatam, vengadam, venkatam on November 18, 2018 by raghuram. Saying ‘mandhiraththAl’ – could be construed as using it as a means, and saying ‘maRavAdhu vAzhudhiyEl’ – could be construed as saying that one should perform that means without fail, and saying ‘vAzhalAm’ – could be construed as that if one performs such means then there is a benefit/end/destiny for that. This pAsuram is this AzhvAr’s ‘nORRa nonbu [thiruvAimozhi – 5.7]’. Like how that was for nammAzhvAr, where he said ‘nORRa nOnbilEn nUNNaRivilEn [thiruvAimozhi – 5.7.1]’ (I do not have karma yOgam performed to attain the result/destiny; I do not have subtle knowledge related to gyAna yOgam which is focussed on knowledge about self and god), saying about his Akinchanyam (utter destitution), and ‘Agilum unnai vittu onRRum ARRA kiRkinRilEn [thiruvAimozhi – 5.7.1]’ (Not having bhakthi yOgam which is impossible without these two, i.e. karma yOgam and gyAna yOgam, but after meditating upon your qualities, I am unable to survive even for a moment without You who are the saviour), saying there is no dearth of interest (toward Him) – this is how nammAzhvAr divined. In the same way, in the 4th pAsuram thirumangai AzhvAr sang ‘mandhiraththai mandhiraththAl’ thus divining that there is no dearth of interest (toward Him), and in this 10th pAsuram he is divining about his utter destitution. ulagam Eththum – which is worthy of praise by one and all in the world! vada AnAy – Oh One who is like an elephant that stands in the thiruvEnkatam in the north! kuda pAl AnAy – Oh One who is like an elephant in the westerly (in sleeping pose in thiruvarangam)! guNapAla madham yAnAy – Oh One who is like a proud elephant (in thirukkaNNapuram)! enRum – at all times! pin AnAr vaNangum sOdhi – like a luminous entity who could be surrendered to by those living after your incarnations! mudhal AnAy – Oh the cause of the world! pon AnAy – Oh One who is like the gold! pozhil Ezhum kAval pUNda – Oh One who is having the fame due to giving divine protection to all the seven worlds! en aRivan – what else do I know to say? (Akinchanyam). pon AnAy – Oh emperumAn You who are my destiny! As said in ‘rukmAbham svapnadhee gamyam [manu smruthi – 12.122]’ (Should only meditate upon the supreme being who is … and like gold …), and ‘avyayO nidhi: [mahAbhAratham – sahasranAmam – 301]’ ((emperumAn) is the ever lasting (fixed) deposit of wealth), and as ‘vaippAm [thiruvAimozhi – 1.7.2]’ (emperumAn is the wealth (that is the goal)), in smruthi, ithihAsa, and purANas, by the word ‘nidhi’ it talks about destiny/end. Wealth is – one that helps during crisis, one which if known to exist would bring back the life (of its owner), and one which is enjoyable by everyone. (Why talk about destiny/end when in the context of means?) – saying this now is to imply – only if I knew that there is some other destiny than You, would l be knowing about some means other than You. Or, since AzhvAr is saying ‘pozhil Ezhum kAval pUNda’, thus saying that emperumAn Himself is the means, and since in ‘ananyasAdhyE [bharatha muni: – vishvaksEna samhithai]’ (When someone else cannot get you what you need, then with full faith praying to the One who is fully qualified (for getting you that), saying ‘Only You shall be the means please’ is saraNAgathi), and so since He is the suitable means for getting the destiny, AzhvAr is first saying ‘pon AnAy’, thus saying that He is the destiny. pozhil Ezhum kAval pUNda pugazh AnAy – by this, AzhvAr says ‘You are also the means’. Oh the protector of leelA vibhUthi! pozhil Ezhum – talking about all the seven worlds. By this – it implies the worlds below as well. It implies all the oval shaped worlds, that is said in ‘eedhRuSAnAm [SrI vishNu purANam – 2.7.27]’ (There are thousands, ten thousands, crore of crores of oval shaped worlds (in this environment of prakruthi)). pozhil – world. kAval pUNda – You are unlike the kings of the world who while having taken the crown would use others to protect his people, but is like one who with a weapon in his hand looks out for the safety of his town, You are protecting all the worlds with great attention. pUNda – You have taken this protection as a penance; You protect by all means even in the presence of any hindrance/danger in protecting. That is, even if one of very close relationship like mahArAjar (sugreevan) say ‘vadhyathAm [SrI rAmAyaNam – yudhdha kANdam – 17.29]’ (this vibheeshaNan shall be killed along with his ministers in most harsh way), Your staunchness of protecting is like your reply ‘na thyajEyam [SrI rAmAyaNam – yudhdha kANdam – 18.3]’ (There is no way I would reject him (vibheeshaNan) who has come in the form of a friend). As saying in ‘abhayam sarva bhUthEbhya: [SrI rAmAyaNam – yudhdha kANdam – 18.33]’ (I give protection from all things (to those who surrendered to me), (this is my vow)), You would protect me without even leaving that responsibility to me. By this – You are the one who protected me, removing my ignorance, scent of prior actions, and their taste. Or, pUNda – He is in the form of sweetness itself that is the destiny; without any other option He is being the means also which He takes it upon Himself; even though milk may be the medicine to remove the bile (piththa), one would not consider it as a decoction (kashAyam), but only as a medicine; so – You Yourself are anxious to be the means, says AzhvAr. pugazh AnAy – Oh You having the splendour due to protecting so! It is said too as ‘yaSasaScha Eka bhAjanam [SrI rAmAyaNam – kishkindhA kANdam – 15.19,20]’ (He is being the holder of fame (due to protecting everyone)), and as ‘ulappil keerththi ammAnE [thiruvAimozhi – 6.10.1]’ (lord with endless glories). As said in ‘yAni nAmAni gauNAni [mahA bhAratham – anusA – 153.13]’ (I shall tell you the divine names of vishNu, which are based on His qualities. These were divined by noble ones. I shall say these for the goodness of the world (stating so, bheeshmar says to yudhishtra the thousand divine names of emperumAn)), your divine names are to express the qualities and acts of Yours that are due to Your vow of protecting. igazhvAya thoNdanEn nAn – By this it talks about the true nature of ones (adhikAri svarUpam) who attain the means (prApakam) and destiny (prApyam). Like how for You the whole form is greatness, for me the whole form is my lowliness. For us the qualification is not having any quality etc that qualify us. Does it mean one should keep doing mistakes? No, one does not have to do any bad deeds; it is already there aplenty in us. All one has to do is humbly convey that to emperumAn. In ‘aham asmyaparAdhAnAmAlaya: [ahirbudhnya samhithA 87.30 and 87.31]’ (I am the abode of all faults..), and ‘rAvANO nAma dhurvruththa: [Sri rAmAyaNam – yudhdha kANdam – 17.12]’ ((I am the brother of) the one who is full of evil qualities named rAvaNan), and ‘amaryAdha: kshudhra: [sthOthra rathnam 62]’ ((I am) one who crossed the limits of vEdhas, having great interest in lowly matters…), it is humbly conveying to Him of one’s own faults only. So what we have to do is convey to Him about our faults, and about not having any qualifications. thoNdanEn nAn – I who am deeply interested toward You. By this, it talks about interest in what is going to be attained (prApya ruchi). Like how for praying Him to be the means, one has to convey to Him that we do not have any qualifications and convey our own faults, to pray that He is the one to be attained, one has to have interest toward Him, isn’t it? It is about not having any qualifications and not tolerating separation from Him that convey our qualification for involving in dhvaya manthram. igazhvAya thoNdanEn nAn – Like how people would scorn a servant who carries water pot if she wishes to marry the emperor, and like how everyone would scorn a beggar who begs for a handful of food if he wishes to be crowned, it is same as me who am a nithya samsAri (forever involved in worldly affairs), wishing to attain You. en AnAy en AnAy ennal allAl – (Anai – elephant) – By this – it talks about how the time is spent by him, he who considers emperumAn only as the means and destiny. I reminisced your qualities (like in ‘manthiraththai) for spending the time only, and not by considering such interest of me as a means (to attain You). He is saying ‘en AnAy’ (~You are like an elephant for me), based on the qualities of elephants. emperumAn also carries these qualities; (1) He having the beautiful form that is wished to be seen always; (2) He having great pride as there is no one equal to or above Him; (3) like how if a king wishes to make a female servant as his main queen then there would not be anyone to stop it, if emperumAn wishes to grant Himself to a nithya samsAri (one who is forever involved in worldly affairs) based only on his surrendering to Him, then there is no one to stop Him – He is having such independence; (4) like how the elephant would stoop down if someone wishes to climb on it on his own, emperumAn having the character of simplicity of giving Him even to those who wish to attain Him by using some other means; (5) having the character of not having anyone who could stop Him from finishing off the enemies of His devotees even if they are related to Him; (6) creates interest towards Him by He Himself giving the bhakthi (devotion) that could be used for enjoying Him – these are the characteristics that are matters for AzhvAr‘s time pass. (How is rope related to bhakthi?) – In ‘ettinOdu iraNdenum kayiRu [thiruchchandha viruththam – 83]’, bhakthi is referred as a rope. It is about tying emperumAn in the pillar/post that is mind, using bhakthi that is rope, so that He would not be able to go away. By repeating ‘en AnAy’ (and by comparing the aforementioned respective qualities), AzhvAr implies that these qualities are always in his mind, and are the matter for his time pass. It is not possible to remove this from his mind. AzhvAr cannot indulge in material pleasures – since he became afraid of those and so joined emperumAn. AzhvAr cannot indulge in other means – since he has surrendered to the means that is emperumAn who does not tolerate other means. So AzhvAr can only be involved in the matters of emperumAn by talking about his many qualities. en aRivan – would I know any other means mentioned by the SAsthram? Would I know the qualities like ‘do not disrespect the noble people’ etc. (qualities such as ones listed in SrI bhagavath gIthA chapters 7 through 11)? Would I know karma yOgam? Would I know gyAna yOgam? Would I know bhakthi yOgam that can be attained through these two yOgams? What do I know? Like the dawn that came upon someone sleeping, when I was roaming as one interested in worldly pleasures, I saw, as you showed, the greatness of You. This is all I have got – where did I see other means – is what he is saying. ezhaiyEn – What can I do if my love for seeing You is unbounded? During those times when I was interested in worldly affairs only, I did not have any control or limits; then how would I be able to control or limit in the case of wishing to enjoy You? Without having ability to think that this is good and that is not good because of my my excessive interest, I had immersed in worldly matters; this is all I had done isn’t it? (now also I am showing interest towards You without any control or limit). If you are going to consider this my love for You as my using it as a means and You try to reject me, then you would have to reject the nithyasUris first before rejecting me. This entry was posted in iraNdAm Ayiram, thirunedunthANdakam and tagged srirangam, thirumaliruncholai, thirumuzhikkalam on November 14, 2018 by raghuram. pARkadalAy – Did He stop with just giving a part of His body to rudhran just by accident like how a worm moving around might create letter forms? When there is a danger to brahmA and others, He thinks He should not stay away, His being the protector (of all), and so giving lower priority to paramapadham, He comes to ksheerAbdhi (milky ocean) and lies down there. Oh such emperumAn! Oh the One who shows Himself whether one wished for it or not, is the One who is not showing His fact to me who is longing for it. (following is commentary of aforementioned SlOka). the ‘sa:’ (that) word refers to the same One who was mentioned in the previous SlOka. ‘dhEvai:´ – did He come here for the prayers of nithyasUris like thiruvadi (garudAzhwAn) and thiru ananthAzhVan’ (AdhiSEshan)? Did He not come and incarnate for the dhEvas who wish for other benefits, and who are of the opinion that they are the lords? Are they not ones who would go against Him after getting the benefits they wished for? udheerNasya rAvaNasya vadhArthibhi: – for winning rAvANan who is roaming around destroying all the world due to his pride; when His relationship with everyone as emperumAn is common for everyone, while the dhEvas who pray Him are doing so for other benefits, He came and incarnated for destroying those like rAvaNan, isn’t it? arThitha: – this you see, is the penance that they performed. (just praying). mAnushE lOkE – He is incarnating in the place which even for dhEvas is a lowly place and not looked at. jagnyE – while the common people of the world would live in the womb for ten months, He was present in the womb for twelve months! vishNu – One who permeates everything is one who incarnated in this place (ayOdhyA) which is permeated by Him, to be under the control of those living in this place! sanAthana: – One who is present forever is the One who came and was born as a son for someone! In these ways the One who lowers Himself so much for those who pray to Him for other benefits, is the One who is not showing Himself to me! says AzhvAr. pani varaiyin uchchiyAy – (Oh one who is standing on top of the mountain (thirumalai)) – Did you stop with just showing yourself for those wishing for other benefits? (you didn’t); as said in ‘kAnamum vAnaramum vEdum udai vEnkatam [nAnmugan thiruvanthAdhi – 47]’ (thiruvEnkatam having forests, monkeys, and the clans of hunters), One who shows Himself even for the lowly animals and hunters by coming and standing in thiruvEnkatam is the One who is not showing Himself to me, says AzhvAr. pavaLa vaNNA – (Oh One who is having beautiful divine body like that of gems); He is not having the mediocre form that one could tolerate the wait to see in due course of time. If it was of such form we could relax thinking let Him show up whenever He prefers; His beauty is not such, that we could stay without any interest , when we think about his divine nature. pavaLa vaNNA enguRRAy – (where are you) – since AzhvAr got blurred vision due to immersing in the enjoyability of His form, he is saying ‘where are You’. As said in “rAmam mE’nugathA dhRushtiradhyApi na nivarthathE | na thvA paSyAmi kausalyE sAdhu mA pANinA spruSa [SrI rAmAyaNam – ayOdhyA kANdam – 42.34]” (After rAma went to the forest, dhaSaratha said to kausalya) – Oh kausalyE! my vision has gone away following rAma. It has not returned till now. I don’t see you. Touch me well with your hands), like how dhaSaratha lost his vision, it happened to AzhvAr too. mE dhRushti: – rAmam – anugathA – my eyes have gone behind perumAL. attracted by His beauty. It left the body which holds it and has gone behind the target of the eyes. It appears that the relationship with mother’s home (my body, for the eyes) is only till it gets the attraction of the in-laws’ home (rAman’s beauty)! me dhRushti: – saying so he (dhaSarathan) is celebrating the ways of his eyes. Distraught due to the separation I lay on the floor; my eyes got the opportunity to go with Him! Wish I had not been the holder of those eyes, but the eyes themselves, says dhaSarathan. na thvA paSyAmi – if asking – while you who are the holder of those eyes, why have the eyes gone behind Him? – dhaSarathan says that he deduced the cause from the action! While you (Kausalya) have come stood here, I don’t see you; hence I knew that they went behind Raman. The senses of the body (indhriyas) are such that they are learned about based on anumAnam (conclusion based on previous prathyaksham (understood by the senses)). When seeing things we come to know that there are senses in the body; when nothing is seen, then we learn that the senses are not present. kausalyE – not seeing you not because it is kaikEyi standing in front of me. sAdhu mA pANinA spRuSa – please do not think about the cruelty I executed, but think about my pitiful state, and feel ‘alas! (aiyyO)’ and touch (comfort) me. Please do not think that I decorated Him for crowning Him and then sent Him to the forest, but think ‘Oh he might die due to separation from Him!’, and touch (comfort) me, says dhaSarathan to Kausalya. bhattar would divine, ‘eyes have gone behind Him; to find out whether the seeing sense has gone behind Him or not, you please touch and search me, says dasarathan’. pavaLa vaNNA engu uRRAy – where have you gone while having the form that is for the devotees as said in ‘bhakthAnAm [jithanthE sthOthram – 1-5]’? Is your showing us the greatness of your divine body, to hide it from us? Or, engu uRRAy – Thinking that He would never not show up after seeing this longing, and that keeping this longing itself as the reason He would show up, AzhvAr is groping his hand in the air saying engu uRRAy (where are You); as I extended my arm He would be felt, and then I could catch Him – thinks AzhvAr. Since he is like the creeper plant lying on the ground looking for a stick to climb on to (flagstaff), He would wish to look for Him (who is that stick). jIvAthmA can be called as such creeper. emperumAn – engu uRRAy – While your property is suffering, where are You the owner hiding? It is only the owner who would come to the property; is it possible for the property to go to the place of its owner? It only the hungry person who would go to the place where there is food, and not the food that would come to that person, will it? unnai nAdi – Searching for You who is unequalled in enjoyableness, and Who is One to be attained. You being the attainable is the reason for my urge to reach You. unnai nAdi – It has become such, that I have to look out for You who has been trying for me (edhir sUzhal pukku [thiruvAimozhi – 2.7.6]’) from time eternal! As said in ‘OdinEn Odi [periya thirumozhi 1.1.1]’, I was running behind worldly pleasures, and you got hold of me and informed about the truth and made me not wish for anything else than You, and made me as said in ‘thaLir puraiyum thiruvadi en thalai mElavE [thirunedunthANdakam – 1]’ thus keeping Your divine feet on my head as if it is an honour for You; are all these for not showing up when now I am suffering due to separation? EzhaiyEn – my many wishes does not let me stay put, replies AzhvAr. I am one with such a huge wish, says AzhvAr. That does not allow me to be patient thinking ‘let Him do further whatever’. inganamE Uzhi tharukEnE – it cannot be said that He is subservient to His devotees; it cannot be said that He would show Himself up by considering our qualifications; given so, losing Him is due to my sins only, isn’t it? Would I spend the rest of my life suffering? inganamE – Like how in the forest the rishis showed Him their bodies eaten by the rAkshasAs as said in ‘Ehi paSya SarIrANi [SrI rAmAyaNam – AraNya kANdam – 6-16]’, AzhvAr is showing his body eaten by love. uzhi tharugEnE – Like the body that is taken up in hell, my life has become the ever experienced suffering that does not end and also not tolerable, says AzhvAr. I have not been able to get the enjoyment of the experience of Him, nor am I able to stay put like seethA pirAtti by considering the true nature of AthmA as subservient, nor am I done with like chinthayanthi and chakravarthi; It has become second nature for me to be always experiencing the suffering of separation! says AzhvAr. This entry was posted in iraNdAm Ayiram, thirunedunthANdakam on August 21, 2018 by raghuram. Since the place he is in is not got to be thirukkOvalUr, and since emperumAn did not come to the place where he was and showed Himself, he called Him using the true characteristics of emperumAn that would be the reasons for Him to come and show Himself – in previous pAsuram. Then, he thinks ‘If we consider His ways, He would go by Himself and show His form to those even having a lit bit of interest; He is One who shows up without considering the merit or absence of it in a person; so such blemish would not occur in Him; so my losing His divine vision is due to my sins only; so due to my wish in vain and not able to let go of Him, and so toiling in this body, my state has become like that of being yAthanA Sareeram (body which one gets into while going to hell) which would not be destroyed nor be tolerable, and so am being put up in this place and be sorrowful’ – AzhvAr is sad thinking about his state. pani varaiyin uchchiyAy pavaLa vaNNA! madhiL kachchi UrAy – Oh One who lives in the city of kAnchee having divine ramparts / walls! pErAy – Oh One having divine presence in the city of thiruppEr! kongu Ar vaLam konRai alangal mArvan – and such (rudhran is ) having in His chest the garland of koNRai flower that is having honey and much beauty. pArkadalAy – Oh One who is resting in the divine milky ocean! pArin mElAy – Oh One who incarnated in the earth (for doing good to those living here)! pani varaiyin uchchiyAy – Oh One who stood at the top of cool divine thirumalai (thiruvEnkatam)! pavaLa vaNNA – Oh One having pleasant divine body like a coral! engu uRRAy – where have You gone in to? emperumAn – On my lord! inganamE – in these ways only. vangaththAl mAmaNi vandhu undhu munneer mallaiyAy – A devotee (named puNdareekan) had in this shore put together a garland, and thought ‘we should decorate Him with this before it loses its sheen’ (and since emperumAn lives on the shore of the other end of the sea), he started draining the sea water thinking he can not go near Him across the sea unless the sea dries up; seeing his love towards Him, He came to the place where he had made a place for Him and rested there on the ground (without Adhi SEshan), the place which then became to be known as thirukkadal mallai. But, while it would have been apt to just say ‘munneer mallai’ why add adjectives (vangaththAl mAmaNi vandhu undhu …) – ship is one that would push things from one island to the other; likewise, He who is set in paramapadham got pushed into this world and got Him lying down on the floor – due to the love for His devotee. Here the ship is His love towards His devotees. mAmaNi – gem of very high value; This love pushed that gem which is as said in ‘kaiyAr chakkaraththu en karu mANikkam [thiruvAimozhi – 5.1.1]’ (with the divine hand well fixed with the divine disc, One who made me enjoy your attractive blue gem like divine form! ), and ‘vAnavar uchchi vaiththa peru mANi [periya thirumozhi – 9.5.4]’ (nithyasUris keep Him in their head as a valuable gem). vandhu undhu – He is lying down in the sea shore with no one to come and have Him! Just as how one who knows the value of ruby gem would keep it safely tied in a valuable cloth, One who is ever enjoyed by nithyasUris is the One who is here lying down the shore – there is no one who understood this greatness and nurture Him here, that the state in which you see, He is staying here on the floor; even if some people come to Him they would ask for other things and go away, alas, there are none who wish to get Him. One who could come to the place of a devotee and show Himself, is the One who is not showing Himself to me who is longing. Unlike in thirukkadal mallai where He is present without the care of anyone, here some people of high quality have constructed these walls which we got the opportunity to see – says AzhvAr. He talked about his sadness of seeing no one to care about emperumAn there; here he is caring that emperumAn has been saved with the walls raised; even while he is sad due to not seeing emperumAn, his true nature is such that he is caring seeing whether there would be any danger to emperumAn. Or, the walls are such that the enemies cannot get into the place, says AzhvAr. mallaiyAy madhiL kachchi UrAy – stuff that comes in at a shore would get sold in a city only; likewise, emperumAn came ashore at thirukkadal mallai and got sold (cared for) at kancheepuram. Caring for Him considering His tenderness, and, grieving/being angry considering ones’ own state (of not getting the vision of Him) , are both apt for a jeevAthmA. pErAy – in the aforementioned, he talked about how emperumAn is anxious whether He would get the devotes; here – as said in ‘thirumAlirunchOlai malai enREn enna thirumAl vandhu en nenju niRaiyap pukunthAn [thiruvAimozhi – 10.8.1]’ (~(even though I was not interested in You), just based on the reason of my saying ‘thirumAlirunchOlai’ You came and took me as yours), He is present (in the dhivya dhESam thiruppEr) to get the devotees for Himself, and that is He who is not taking me who cannot survive if separated from Him, says AzhvAr. By this, it says that emperumAn comes to the place of His devotees and shows Himself. Now it talks about His coming and showing Himself without looking at one’s disqualifications. kongu etc – Like a saying in thamizh, ‘nAyE koL, pEyE koL’, that refers to sivan who is being with ghosts, got a place in the divine body of emperumAn, but that divine body is being hard for me to reach, laments AzhvAr. Oh the One who in a part of His divine body is having sivan who is decorated with ‘konRai’ garland that is having honey, fragrance and beauty. kongu – honey. Ar – excess of it. vaLam – beauty. (aRRu – a meaningless affix allowed by thamizh grammar). Beauty of a flower – being fresh, and full of fragrance. kulavarai etc. – One who is having pArvathy as is wife; while it would have been enough to just say, ‘giving part of his divine body to rudhran’, this pAsuram is giving so many attributes to him describing so much, which is to make his wrongful pride explicit: trying to be equal to sarvESvaran who is decorated with divine basil/thiruththuzhAy and who is the husband of SrIdhEvi, he wears konRai flower garland and thinks ‘I am eeSvaran’ – it is to such sivan of bad disposition that He gave his body. 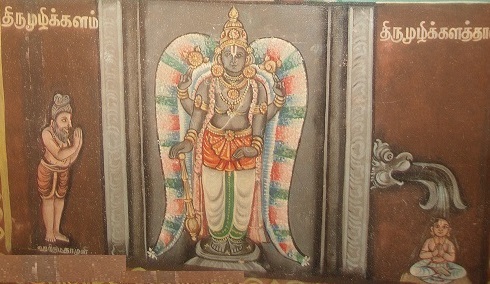 kongaththAr vaLankonRai alangal mArvan – Being opposite of ‘thaNduzhAy mAlai mArban [thirumAlai – 5]’ (One having chest decorated by thiruththuzhAy garland). 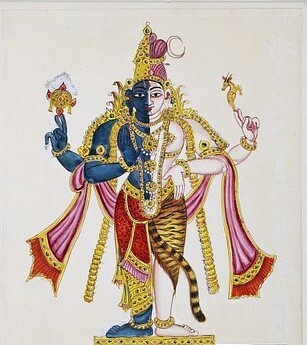 Seeing eeSvaran protecting/sustaining the worlds wearing unique garland of thiruththuzhAy, he is wearing konRai garland thinking ‘I too should need a garland if I should be called eeSvaran and so look for one’. kulavaraiyan madappAvai – Being a counterpart of ‘malar magaL virumbum nam arumpeRal adigaL [thiruvAimozhi 1.3.1]’ (being joyed about the two aspects of being eLiyavan (simple to attain) and ariyavan (difficult to attain)) being desired by One who is having the lotus flower as her residence, our master who is difficult to attain). Oh He is being Sriya:pathi (husband of lakshmi), when we get such opportunity we should also be with a wife – thinking so he is being umApathy (husband of umA (pArvathi)). idap pAl koNdAn – As counterpart to ‘vala mArbinil vAzhginRa mangai [thiruppallANdu – 2]’ (thAyAr who lives in the right chest of Him); (rudhran is having umA on his left side). pangaththAy – (pangu – a share); As said in ‘kUr ALum thani udamban [thiruvAimozhi – 4.8.1]’ ((kUr – share) having divine body which the consorts individually (part by part) enjoy and consider to be their own abode, which is unique, and spiritually distinguished), emperumAn gave a part of His body to rudhran as if in competition with periya pirAttiyAr . It is the divine body which He gave to Her who never separates from Him, which He also shared with rudhran who thinks ‘ISvarOham’ (I am the lord). He does not see rudhran’s state, or Her state, or His own state – He sees only His relationship with them (AthmAs). The form that He gave to the one having perversity of mind that thinks ‘I am the lord’, is not available to me who does not survive without seeing that form, says AzhvAr. This entry was posted in iraNdAm Ayiram, thirunedunthANdakam on July 29, 2018 by raghuram. As AzhvAr became sorrowful and thought – ‘We could not experience at that time when He strode the worlds’, and (as He said), ‘I am there with that beauty in thirukkOvalUr, come and experience it!’, as AzhvAr took along his mind to experience Him (there), he forgot about the saurya (not running away in a fight (absence of parAngmukhathvam)), and veerya (not getting confused and agitated during fight (unlike arjuna did in kurukshEthra)) of Ayan (of thirukkOvalUr dhivya dhEsam), also forgot about experiencing Him, and as he saw Him in front of his eyes he saw the soft delicateness of emperumAn, and thought about the nature of the place which is having many asuras, and thought ‘Oh what might happen to this divine One’, thus fearing for Him. It is the nature of AthmA to be loving of and be caring of Him. As He showed His valor etc., and cleared his fear, he took his mind along and was involving in experiencing Him – in the previous pAsuram. In this pAsuram – AzhvAr is deciding that we shall go to thirukkOvalUr and experience the emperumAn. Since it is he (who is having extreme love toward emperumAn), his divine feet are not moving; thinking about the beauty etc., of Ayan (of thirukkOvalUr) his senses got weakened as said in ‘kAl Azhum nenjazhiyum kaN suzhalum’ [periya thiruvanthAdhi – 34] (~ my feet would get stuck, mind would be destroyed, eyes would not focus, even if I just hear about how He is lying down in the divine milky ocean), and to be according to the true nature of self (to be subservient and not do something on own efforts) – that is, both at the time of surrendering to Him, and at the time of enjoying Him (by doing services) – surrendering to Him when He comes and pushes us to surrender to Him, and enjoying Him when He comes with His own efforts and making us enjoy Him, is our true nature. This is as said in ‘kUvudhal varudhal seyyAy [thiruvAimozhi – 9.2.10]’ (~You call me and make me serve you, and You come to me), ‘en thiRam sollAr [thiruvAimozhi – 8.3.7]’ (He is not saying a single word about me His ardent devotee). Thus due to decimation of senses, and not having eligibility (as per his nature), he is not able to go there; but he did not have the place he was in to happen to be thirukkOvalUr; he started calling (the place); as he was longing to enjoy thirukkOvalUr, why would he start calling other divine places? Like how one would pick and collect multiple grains (spilled in the field), as Ayan’s nature is shining in dhivya dhEsams, AzhvAr is calling them based on that. It is like (praising SrI rAmA through multiple examples as) said in ‘vishNunA sadhruSO veeryE [SrI rAmAyaNam – bAla kANdam – 1-18]’ ((SrI rAman) is equal to vishNu in manliness; He is pleasing to the eyes like the moon; is like the annihilating fire in His anger; is equal to the earth in His patience). neeragaththAy – Oh One who is giving divine presence in thiruneeragam dhivya dhEsam! nedu varaiyin uchchi mElAy – Oh One who stood at the top of tall and great thirumalai! nilAththingaL thuNdaththAy – Oh One who is giving divine presence in the divine place called nilAththingaL thuNdam! niRaindha kachchi UragaththAy – Oh One who is giving divine presence in the divine place called Uragam by pervading the whole of kachchi (by your qualities)! oNthuRai neer vekhAvuLLAy – Oh One who is in sleeping posture at the beautiful shore of water tank that is in thiruvehkA! ulagam Eththum kAragaththAy – Oh One who stood in the divine place called ‘thirukkAragam’ for the whole world to worship! kAr vAnaththuLLAy – Oh One who lives in the divine place called kArvAnam! kAmaru pUm kAviriyin then pAl mannu pEragaththAy – well set in the town of thiruppEr (of appakkudaththAn) that is on the south shore of very beautiful kAvEri! en nenjil pEradhu uLLAy – Oh One who is showing Himself to my mind without break or going away! perumAn – Oh One having many many divine places! un thiruvadiyE pENinEnE – I am calling for your divine feet (wishing to see it). neeragaththAy – Oh one residing in thiruneeragam! Since One who is of neermai that is of quality of neer (water), is residing here, the place is referred to as neeragam. Even though the nature of AthmA is same for everyone, it is due to karma there are differences of being human, dEvas, etc., and also based on that there are differences in their knowledge and thoughts; but water is the life line for every one of them; likewise, the emperumAn of thiruneeragam is the life line for everyone. So the divine feet that stored all the worlds is the life line for everyone; since this nature of emperumAn is highlighted in this dhivya dhEsam, Oh One who is enjoyable to everyone without any limits, is not showing yourself to me! wonders AzhvAr. nedu variyin uchchi mElAy – Oh one who is divining His presence in thirumalai such that You are enjoyed not only by those in the earth, but also in the higher worlds. This is as said in ‘vAnavar vAnavar kOnodum namanRezhum thiruvEngadam [thiruvAimozhi – 3.3.7]’ (nithyasUris (eternally free souls of paramapadham), with sEnai mudhaliyAr (vishwaksEna – who is their leader), bowing (which highlights their total dependence), feeling accomplished (having realized their true nature), divine place having the name thiruvEngadam); the state of thirumalai reminds of the divine feet of nAyan who strode all the worlds; You who would show up even for those who think of themselves as lords, is not showing yourself to me! wonders AzhvAr. nilAth thingaL thuNdathhAy – this is also being the name based on the nature of nAyAnAr (emperumAn, the lord). Oh, like the moon who is complete in all the arts, One who helps those who suffer from the three types of thApams by clearing those thApams, and being sweet to those who enjoy You! As said in ‘sUryAmSu janitham thApam ninyE thArApathi: Samam [SrI vishNu purANam – 5-10-3]’ (like how a discerning mind would remove the sorrow caused by pride, moon the head of stars removed the heat caused by the rays of sun), for the people who suffer due to the heat of the sun it is the moon that is reason for their calm and comfort; nilAth thingaL – during waning phase its light would be dimmed, and so it is mentioned as ‘nilAth thingaL’ (to imply full moon). Since the divine abode is a part (thuNdam) of the earth, he is saying ‘nilAth thingaL thUNdam’ based on that. Since he mentions about it specifically saying thuNdam, he is saying it to show its uniqueness compared to other dhivya dhEsams. This reminds about emperumAn who is present with removal of tiredness he got due to striding the worlds, and being lovely. Oh one who removes the tiredness and gives happiness to everyone, is not showing yourself to me! wonders AzhvAr. niRaindha kachchi UragaththAy – Oh one who is present and divining in the dhivya dhEsam of thirukkachchi Uragam for the whole of kAncheepuram to be filled with your beauty and kindness! He is present in thiru Uragam that reminds us of His divine posture in thirukkOvalUr! niRaindha kachchi – As said in ‘SObhayan dhaNdakAraNam [SrI rAmAyaNam – AraNya kANdam – 38-15]’ (SrI rAman, by His brightness, appeared like a young moon which rose just then, in that forest), the whole of thirukkachchi is filled with His brightness; also kachchi that is filled with divine abodes (thirukkachi being one having so many dhivya dhEsams). oN thuRai neer vekhAvuLLAy – Oh one who is in sleeping posture in the shore of beautiful thiruvehkA! Unlike other places, since this is the one where thirumazhisaip pirAn got down and took holy bath, this is referred to as beautiful shore. He is staying put and lying down in this shore to show that He obeyed AzhvAr‘s words. Going behind the devotee when he left, and coming back as that devotee came back and lying down back again but in the opposite direction keeping His head where His divine feet were earlier – isn’t this how the ‘pArathanthryam toward devotees’ is present in there! As said in ‘irundha Uril irukkum mAnidar eththavangaL seydhAr kolO [periyAzhvAr thirumozhi – 4.4.7]’ (Oh what penances they might have performed to be rewarded of being in the town where His devotees are present! ), for SrIvaishNavas it is the place where a SrIvaishNavan lives is the preferred place – likewise, it is for eeSvaran the place that is preferred is where there is a connection of devotee. As said in ‘vAsal kadai kazhiyA uL pugA kAmar pUngOval idai kazhiyE paRRi ini [mudhal thiruvanthAdhi – 86]’ (neither going out nor going in, you are staying in the in-between place (because that is where we three mudhal AzhvArs had stayed once)! ), how He had entered and jammed Himself into the place where the three AzhvArs were present, and even after they left, He did not have the mind to leave that place – this is how it reminds us about the nature of emperumAn at thiruvehkA (being dedicated to devotees). soNNa vaNNam seydha perumAn mingled with the devotees with his divine head in the place of the feet. Oh You who is steadfast in the place that was of the devotees, are not showing Yourself to me who would not bear the separation! uLLuvAr uLLaththAy – Oh one who lives in the hearts of those who live with the thought that there is a lord for me! It is for reaching a devotee’s heart that He is present in a dhivya dhEsam (this is the reason for AzhvAr to talk about the heart of devotees when in the setting of listing these dhivya dhEsams). ‘ninRadhu endhai [thiruchchandha viruththam – 64]’ (He being present in these dhivya dhEsams is doing all those sitting, standing, etc., in my mind too), etc. You who would live in the hearts of those who have got even a little love toward You, are not showing Yourself to me! wonders AzhvAr. ulagam Eththum kAragaththAy – Oh who is divining his standing presence in thiruk kAragam for the whole world to heap praises! As said in ‘lOka vikrAntha! charaNau [vihagESvara samhithai padalam 22]’ ((vikrama: = stepping) – Oh emperumAn! adiyEn am leaving all the relatives, and all the means, and all other destinies including kaivalyam, and surrendering unto the divine feet of You who strode the three worlds! ), for all the worlds to argue (with Him saying – Your divine feet is common and available for all), and surrender, He having such history of taking the three steps, that Ayan being amicable for all to surrender, and this dhivya dhEsam (too) lets us think about that emperumAn! Oh You who is available for all to surrender, are not showing Yourself to me! kAr vAnaththu uLLAy – Oh one who lives in thiruk kArvAnam, who is having the nature of cloud whose nature is to pour rain! The divine name for dhivya dhEsam is based on the nature of this emperumAn. Cloud would pour rain without expecting any benefit, and without any distinction of water or land (to everyone) – this dhivya dhEsam reminds of the generosity of Ayan (of thirukkOvalUr), who kept His divine feet on the heads of all the people whether they longed for it or not. kaLvA – Oh one who steals! (apahAram). We would not call Him ‘kaLvA’ since we do not have such love towards Him like this AzhvAr. Stealing is – hiding something that belongs to one by making it not his. His stealing is – not showing His beauty which is to be experienced by His devotees. AthmApahAram is when the sentient does not agree that the AthmA belongs to Him; whereas that is how it is regarding AthmA, we don’t agree to that but say ‘svathanthrOham’ (I am independent) – this is our stealing. Is your preventing my stealing, is to steal (not showing) Your AthmA (divine body)? Making the meaning of AthmA to flourish, is for destroying the meaning of ‘bhakthAnAm [jithanthE sthOthram – 1.5]’ (everything of You are there not for you; they are there for Your devotees)? he is not able to live by dying – because being present under His control – (sIthA) pirAtti could not proceed with attempting to hang Herself – because She is His property; nammAzhvAr, even though was desperate when singing ‘uyirinAl kuRaivilam [thiruvAimozhi – 4.8.10]’ (There is no use of my AthmA (self) which is not liked by emperumAn), he had to beg Him for ending his life as he sang in ‘sAmARE – paNi (kaNdAy) [thiruvAimozhi – 4.9.1]’ (to die (and shed my body), you have to mercifully speak a word (as in the case of SrI bhagavath gIthA 18.66 “mOkshayishyAmi” (I will free you)). perumAn – Oh one who does not have any count of such dhivya dhEsams! Since there is not a count of dhivyadhEsams that remind us of Ayan (of thirukkOvalUr), and since he (AzhvAr) does not have the ability to talk about all those dhivya dhEsams, he is collecting them together with this word (perumAn). Or, perumAn – Oh the lord who accepts our services! Oh I am suffering because of knowing the relationship with Him, says AzhvAr. If I had not known that then I would have happily done whatever came to mind as one interested in worldly matters, like the samsAris (people interested in worldly matters). Is it correct for him to feel bad for not being like the samsAris who undergo the three types of suffering? – the suffering of samsAris due to their ahankAram and mamakAram are tolerable; the suffering that AzhvAr goes through by not getting emperumAn even though he wishes for it so much – this suffering is not tolerable, isn’t it? (ALavandhAr too said) ‘sarvam sahE [sthOthra rathnam – 25]’ (my) sorrows are tolerable (but not that of your devotees), and as I said in ‘nAn kaNdu koNdEn nArAyaNa ennum nAmam [periya thirumozhi – 1.1.1]’ (I have obtained the divine name nArAyaNA), I thought it is enjoyable when I got You. But it has ended up being the reason for my sorrows! When one gets the knowledge about their true nature, there would be happiness only when one gets life that is according to that nature; when that is not the case, it is all sorrows only, isn’t it? It is for one who is having indigestion that the hunger is preferable; for one who is very hungry, it is that hunger that is the cause for his suffering. ‘On one hand I am not enjoying in worldly matters like the samsAris; on the other hand, I am not enjoying in Your experience like the mukthAthmAs (liberated from the cycle of birth); I am not being in the state of ‘thath thasya sadhruSam bhavEth [SrI rAmAyaNam – sundhara kANdam – 30.30]’ (it would fit His nature (to get me when He likes)) like mumukshus (those wishing to be liberated) who have understood their true nature; like being not in any of these groups, I am having this state of suffering!, wonders AzhvAr. emperumAn asks – For you who were having affinity towards bodily affairs and earthly interests, I showed you the true goal that is suitable for your true nature, and affected you such that your union with and separation from me would be happiness and sadness for you – while there is all these help of mine for you, why are you calling in this way like an ungrateful? un thiruvadiyE pENinEnE – I am not calling while being ungrateful for things You have done for me; in those matters I am grateful to You; I am calling due to the longing to see Your divine feet – says AzhvAr. Is my purushArtham (aim) about getting a few better things compared to worldly people? (No,), it is about seeing You with my eyes that is the purushArtham for me, says AzhvAr. Because You have not shown Your divine feet, the good things You did for me have become the reason for my sorrows, is the thought here. un thiruvadi – Your divine feet that is both the means and destiny. Mentioning many of these divine abodes and then saying ‘un’ (Your in singular) thiruvadi, shows that AzhvAr is experiencing the ways of Ayan (of thirukkOvalUr) only in all these dhivya dhEsams. un thiruvadi – Your divine feet that is of such nature. This entry was posted in iraNdAm Ayiram, thirunedunthANdakam on April 25, 2018 by raghuram. As AzhvAr set out to enjoy by taking along his mind also, that emperumAn who is enjoyed was the one being in the divine pose of thrivikraman who without differentiating between noble and otherwise had kept His divine feet on their heads and gave Himself to them. Thinking about this, AzhvAr forgot that it is to be enjoyed, and started becoming afraid. Why be afraid, is His standing in the pose not par for the enjoyment? By the state of one like himself who are the enjoyers, and by the state of Him who is enjoyed, fear bubbled up. AzhvAr‘s love for Him – is such that fear and doubt is shown in the wrong place (where emperumAn is the almighty). AzhvAr‘s love blinds him such that instead of devotion being an instrument for enjoyment, it becomes an instrument for protecting Him. AzhvAr‘s enjoyment is emperumAn‘s beauty, etc., and as he thought about emperumAn‘s tenderness, he would have to be scared. When vibheeshaNAzhvAn came amicably and stood for surrendering, mahArAjar (sugreevan) due to being blinded by love, had said ‘vadhyathAm badhyathAm [SrI rAmAyaNam – yudhdha kANdam – 17-29]’ (This vibheeshaNan along with his ministers shall be killed through severe punishment). AzhvAr too thought that since this place is full of asuras and rAkshasas (by character), as he sees this he would have to be afraid. (Are there enemies here? Yes, there are asuras as said in ‘vipareethasthatha asura:’ (Those who do not have devotion towards vishNu are asuras)). (AchAryas always followed emperumAn as He would go in procession. As emperumAn would return to temple, embAr and mudhaliyAndAn would prostrate to each other and hug each other and jump happily with fear removed as emperumAn has returned safely. 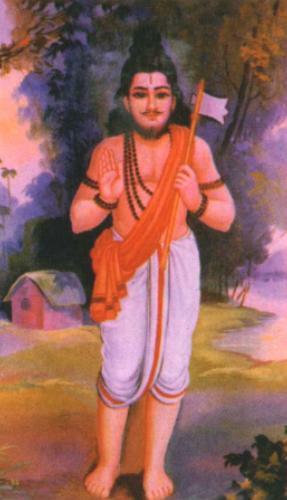 piLLai uRangAvilli dhAsar would carry a knife with him during procession of emperumAn, so that if there would be any small discomfort for emperumAn then he would kill himself with the knife). When AzhvAr loses (the experience) due to fear, it is on the protector to remove such fear and give the experience of Himself to AzhvAr. So too, like how perumAL decided that it would not be possible to convince mahArAjar by showing about the ways of kings like about His promise that He would not reject those who surrender to Him, as ‘na thyajEyam [SrI rAmAyaNam – yudhdha kANdam – 18-3]’ (it is not possible to reject him due to any case), had instead showed the strength of his shoulders, and removed the fear of sugreevan, (thirukkOvalUr emperumAn) showed his strength/pride (incarnations), the guardian of His place (dhurgA), and the protection present in the place (description of the place), thus giving AzhvAr such knowledge, and so AzhvAr being relieved of his fear, tells, ‘Oh mind! Come! let us go and enjoy!’. Shall fear thinking about delicateness of Him; shall be without any fear by thinking about His bravery and virility. vaRpudaiya, etc. – AzhvAr‘s excess of fear is such that emperumAn has to show His strength and make AzhvAr feel better. vaRpudaiya nedum thOL mannar – Divining about the strength of these kings like talking about the strength of hiraNyan, rAvaNan, and such, is to show His strength. They are having strength and having shoulders like mountains. If anything hits a mountain those would get decimated, and no damage would be done to the mountain. Likewise, enemies would get destroyed and these kings’ shoulders would not be affected due to that. mannar mALa – (Aren’t the kings saviours, is it appropriate to destroy them?) – If they have decorated themselves as per kings’ form, but are having excess of asura (demoniac) qualities, then emperumAn would destroy them, is the point. (uLam thottu iraNiyanai – emperumAn checked within the chest whether there was any bit of good quality in hiraNyan)). In the case of such kings, He would not think as – oh they are kings who are there to protect their people. He would only see their demoniac qualities. For those kings like kArthaveeryArjunan of thousand hands to be destroyed without any bit left. vadivAya mazhuvEndhi – (He held the axe in His hands) – As He held the axe in His hand, they simply got destroyed. They got destroyed seeing the sharpness and how His hand held it. (bhattar nirvAham is similar for (karan), ‘ven narakam sErA vagaiyE silai kuniththAn (siriya thirumadal) – seeing the way perumAL held the bow, karan did not have to go to hell; that posture itself was like hell for him). Whereas vaishNavas think that this form of holding axe with anger is not to be supported (worshipped), this AzhvAr is saying ‘vadivAya mazhu’ (beautiful axe); even if emperumAn holds some and any weapon, it would look beautiful; the divine conch is also beautiful to look at as and when He holds it. ulagam ANdu – Since there is no kingdom for SrI paraSurAmAzhvan, this is about rAmAvathAram. paraSurAman, due to the anger that the kings had affected His father, had cut the heads of all the kings and filled the pond with their blood and performed the karmas for His father, is all that He had done. But then, like it is said in ‘snAthvA bhunjeetha [dharma SAsthram]’ (you have to eat only after having taken bath (‘thvA’ being ‘lyap’ prathyaya in samskrutham)), isn’t the phrase ‘Endhi (ulagam ANda)’ (samskrutha ‘lyap’ prathyaya) set to be performed by one person only? Due to same emperumAn doing both, it is acceptable to say in this way. Since in one incarnation both actions were not done, it is acceptable also to consider this as were done in different incarnations. It is for the same reason that further up in the pAsuram, AzhvAr is going to talk about the actions of incarnation as krishNan, since it is the same emperumAn. (Since paraSurAman gave his power to SrI rAman, and so since paraSurAman’s powers were included in that of SrI rAman, it is acceptable to say that both of them had ruled the world, so ruling the world is talking about SrI rAman only). When paraSurAman saw perumAL, He dropped the axe and took up the bow; perumAL got paraSurAman’s bow and His powers and used that bow for winning rAvaNan and other evil persons, and saved the world such that the strong do not trouble the weak. Thus it talks about perumAL (SrI rAman) ruling the world in this way. veRpu etc. – subrahmaNyan who is like a young calf who threw his spear into the big ocean that is having a mountain (veRpu); That is, when mountains were able to fly and were destroying the worlds, indhiran used his vajra weapon and cut the wings of mountains. One of the mountains escaped and hid inside the ocean. Since he (subrahmaNyan) is the head of the army of dhEvas, he learned its hiding place and destroyed it – this phrase talks about this incident. nedum kadal – very vast ocean. Talking about this to show that it was so vast that it would be very hard for anyone else to find where that mountain was hiding. thani vEL uyththa – Throwing the spear that is unparalleled – if he throws his spear then it would not require any other weapon to kill the enemy. While ‘vEL’ refers to kAman, referring to him as ‘vEL’ is about talking of his winning enemies due to his youth and strength. mudhalA venRAn Ur – place (thirukkOvalUr) where The Man (krishNan) who won such subrahmaNyan and others; in the battle with bANan, it is he who came first and foremost, so his name is being mentioned first in the list (of family of Sivan who came fighting). It is said too as ‘nEr sarindhAn kodik kOzhi koNdAn [thiruvAimozhi – 7.4.8]’ (came to the battle, one who is having rooster in his flag). Since there were innumerable persons who came fighting emperumAn, AzhvAr is talking about it in short, saying ‘vEL mudhalA’. Similar to ‘muNdan neeRan [thiruchchandha viruththam – 71]’ (a bigger list is present in this pAsuram). leaving them so had also helped in another way – ‘Oh the trouble I went through taking you as my protector’, and ‘Oh the trouble I went through imagining me to be your protector’ saying so they could hug each other with (remaining) two arms and weep. venRAnUr – place (thirukkOvalUr) where such a hero (veeran) is present. vindhai mEya, etc – AzhvAr is divining about the strength of protection for this divine place. vindhai mEya – She who was present in the forest of vindhyA mountains; while he could have referred to her by just saying ‘dhurgai’, he is saying this (vindhai mEya, madak kanni) to – talk about the forest where she performed penance to become a protector of emperumAn. Even though it is by true nature (of AthmA) one could render service, one would do penance to get the recognition as protector of a divine place, by acceptance of emperumAn; (why sing about her?) – her greatness is resulting in protection of the place, so AzhvAr is divining about her. madak kanni – madam – is a quality where one does not forgo an association with someone. Here, even if there would be any strong enemies to this dhivya dhESam, she would not shy away, but would protect it. kanni – implies not be subservient to any one other than emperumAn. kAval pUNda – not doing the protection based on someone’s instigation, but due to her own desire. kAval pUNda – due to overflowing affection, she involved herself in protecting the place. If she marries someone then there would be a break in her protecting emperumAn, kanni (virgin) implies she is focussed only on protecting emperumAn. kanni – is the name for something that does not disintegrate (similar to ‘kannith thamizh’), so since she does not have annihilation, there is no annihilation (for the protection) of the place. (During the incarnation of krishNan), she had undertaken His command and had gone from thiru AyppAdi to mathurA, and she always holds affection towards Him. (Since she was born before Him, to yaSOdhA, and as an elder sister she was protective towards kaNNan, so) nanjeeyar says ‘she is thambi vaLaikkAri isn’t it’ (so says periyavAchchAn piLLai in this commentary. vaLai – protection). Even though one is a servant , due to one’s overflowing affection would take up the role of a protector. periyAzhvAr too said ‘nin sevvadi sevvi thirukkAppu [thiruppallANdu – 1]’ (divine protection to your beautiful divine feet). kadi pozhil, etc. – arcade having fragrance as its identity. Place which is of spring season eternal. Now, the intention is not to talk about the enjoyability of the place; since this is the occasion of talking about the things that aid in removal of AzhvAr‘s fear of safety of emperumAn, our AchAryas divine the meaning of this phrase as aid of removal of fear. There is no other destiny than enjoyment (of things in this world), and liberation (to SrIvaikuNtam); the beauty of this place would attract and tie those who are after material pleasures of this world, and thus would not let them go inside the dhivya dhESam; it is such that ‘do you have to go inside and bring trouble to the One? Is it not enough for you to enjoy the beauty of the place?’. nedu maRugil – (maRugu – divine streets) The divine streets that are beautiful to see by length and breadth, and so would tie those who escaped the beauty of the arcades, and thus prevent them from going inside the temple. kamala vEli – Place having waterways where lotus blooms through out the breadth of them; since the streams would be full of flowers (like a fence), it would attract and keep such people; by this, it says that that the place is having such protection as if there is no other need of protection by people. poRpudaiya, etc. – (poRpu – connection); even if there is no (aforementioned) protection, there is the strength of policing of the dhivya dhESam preventing them entering it. This is the place of residence of the head of people living in the neighboring mountains, who is fond of the dhivya dhESam and who is into protecting it. Unlike protecting it after doing penance, he protects it considering it as his duty. Or, poRpu to imply all the kings around are connected to each other and the group is protecting the dhivya dhEsam; hence mentioning them together in singular (as malai aRaiyan). ninRa – (emperuman) stood firmly, feeling satisfied and happy about the purpose of His incarnation only after everyone surrendered to Him; those who surrender to Him would feel that their purpose is satisfied after getting immersed fully in the enjoyment of Him; in the same way, when people were for other things, He voluntarily showed their relationship with Him and when they surrendered to Him based on that connection, is it required to mention explicitly about the satisfaction He would derive from that? pUngOvalUr thozhudhum – that divine place (the people of that divine place) is enjoyable even without considering Him; this is how this AzhvAr is fully attached (maNdinapadi) to divine abodes. pOdhu nenjE – even after his fears were cleared (based on aforementioned), the divine mind of his was still in fear and still fainted; we don’t have to fear since this place is protector in all the ways, Oh mind! let us go so we can experience this, says AzhvAr. thozhudhum pOdhu nenjE – He is calling like how someone would call ‘let us go for feasting’ (which is enjoyable to everyone); it is said too as ‘thozhudhu ezhu [thiruvAimozhi 1.1.1]’ (worship, be uplifted and be enthusiastic); there is no existence/life when not worshipping; AzhvAr is saying ‘thozhudumpOdhu nenjE’ (Oh mind! let us worship, come on!). This entry was posted in iraNdAm Ayiram, thirunedunthANdakam on February 7, 2018 by raghuram.